Key Club is a service organization that is directly affiliated with Kiwanis Club. Penn Hills High School has had very strong Key Club representation for many years under the sponsorship of science teacher Lisa Frye. 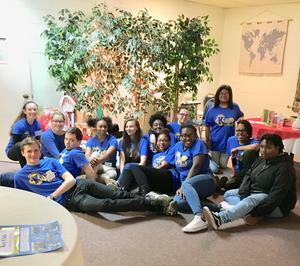 Most recently, Key Club members supported a Holiday Tea that was hosted by Mount Hope Church on Saturday, December 1, 2018. 13 members actively participated and performed such duties as set-up, serving, and clean-up. Ms. Frye received many accolades during the event regarding the performance of the volunteers. The group even received a generous donation from someone in attendance. That donation will be used to help support Key Club initiatives. Penn Hills School District applauds Penn Hills High School Key Club Members and their Sponsor Ms. Frye for their commitment to our Penn Hills Community and donation of time.